Royal Enfield Military motorcycles look great with a sidecar attached. 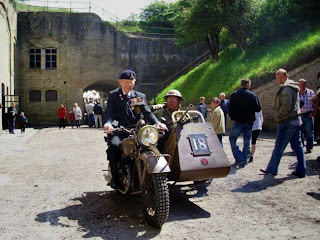 I posted an item noting that it was perfectly appropriate for a British-style motorcycle to pull a sidecar, since the British Army used many sidecar combinations. I illustrated the item with pictures of British sidecar units of World War II. "The Norton Big Fours you show have sidecarwheeldrive, and are a blast to drive off road! Here's a picture of my restored one with a 91-year-old Dunkirk veteran at the handlebars; he drove me around!" Alex turns out to be the author of Welbike's Pages, a web site "dedicated to some World War II vehicles I have an interest in, and the people who fought in them." 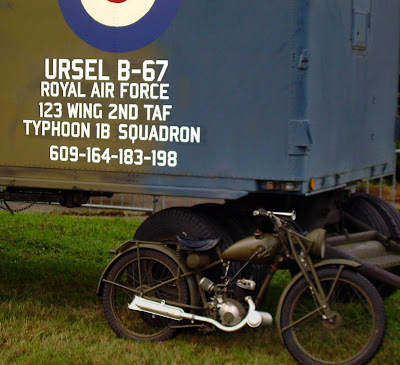 Primarily a picture site at the moment, Welbike's Pages offer an outstanding collection of wartime British motorcycles in action. There's even a section devoted to the Royal Enfield Flying Flea. In fact, Alex says he is working on a book about the Flying Flea. "I live mostly in the Netherlands, but also in Wrightsville, Penn., where I have some Matchlesses, and do maintenance/restoration work for other people in the area. "I have only one Royal Enfield and that's a 1944 Flying Flea (see picture), that came incidentally from Florida, from the estate of an 8th Air Force pilot who 'liberated' the bike from an English airfield when returning home in 1945." Naturally, Welbike parascooters are also a great interest of Alex's. These folding mini-scooters were dropped by parachute in bomb-shaped canisters to give British paratroopers instant mobility in World War II. Activities are going on this week near Arnhem, Holland, to commemorate the 66th anniversary of Operation Market Garden, the battle that inspired the book and, later, movie, A Bridge Too Far. "Mine will be dropped in a container on the original battlefield near Arnhem," Alex advises. 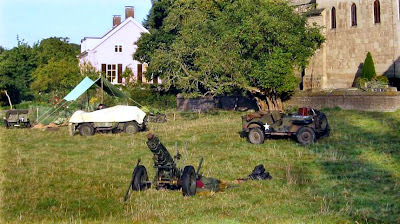 Update: Alex Schmidt sent this email from the front: "Yes am going to Arnhem tomorrow, with the howitzer, and the Flea! Last year's Welbike drop didn't happen due to Dakota trouble, maybe it will happen Friday!"